Unisa Full Length Taupe Boots 6/39. Condition is Used. Dispatched with Royal Mail 2nd Class. These may be new but put used as not 100% sure. Crepe heel and sole. Full length zip. These are a stretch design. Brand New No Tags, Ladies Sole Diva Wide Fit Knee High Boots In A Uk 5EEE. Dispatched with Royal Mail 2nd Class. Very comfy to wear! They’re a faux snakeskin effect, with an elasticated panel at the the back. Zara Comfy Leather Boots. 100% genuine and nothing to hide. Size UK 5 EU 38. leather upper. small print. What is pictured is what you will receive. We cannot be held responsible for false assumptions. Rayne Ladies Boots UK6.5. Condition is Used. One owner. Zip length 14.5in Leather sole, re-soled rubber. Hardly any wear. Colour, red/brown, not quite red & not quite brown. Toes in very good condition. Heels in very good condition. A certain amount of scuff marks on both boots. Approx. 20-30 years old. Hopefully the photos provide enough clarity, if more detail required please contact me. Chunky 3" heel. Real Leather, distressed effect. If you're not satisfied, you'll get your money back. F&f Knee High Boots Brand New Never Been Worn. Dispatched with Royal Mail 2nd Class. 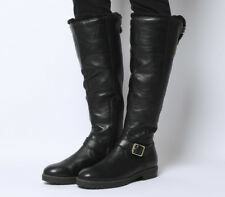 (GORGEOUS FAUX LEATHER KNEE HIGH BIKER STYLED BOOTS BY MOSSIMO. CALF WIDTH CAN BE ADJUSTED SLIGHTLY WITH BUCKLE TOP OF BOOT. FAUX ZIP DECORATION. NICE LOOKING BOOTS :). A lovely pair of brown Dubarry Galway goretex lined waterproof boots in a size UK 4 EU 37 Extra Fit. Photos to follow.